If it has always been a dream of yours to wear limited sneakers at the forefront of sneakerheads, then BNB AIO is your destination. It supports the most popular online stores. The most important features: multi-acc, PayPal autocheckout, keywords finder, captcha solver, link monitor and more. BNB AIO doesn’t stand still, so turn on Twitter and e-mail notifications to try new improvements. Have you found yourself very often cooking without success? Your computer is always freezing because of countless bots on it. You have already spent oodles of cash on so-called ‘Cookbots’ and they still haven’t copped the long-awaited things. Obviously, you have missed the elegant Nike & Carhartt shoes, the unique Adidas Yeezy Boost and the trendy red Bogo. You have been going through a rough shopping patch and it’s time for shopping to become smooth sailing. 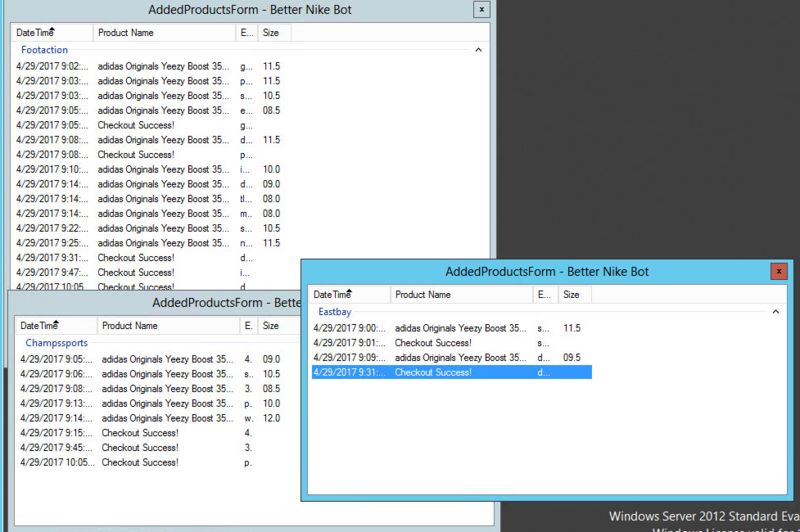 We present the all-inclusive bot – BnB AIO (Better Nike Bot All-in-One). Do not be deceived by its name. It’s not only for monitoring Nike stuff on all shop websites but also Supreme, Bape, Adidas and other ones. BnB AIO is the door to the paradise for trendsetters and followers. Better Nike Bot makes your dreams come true. It's not a big deal for BnB if you want to stand out from the crowd wearing a polka dot NikeLab Jacket or run along NY pavements in the spring in Converse Chuck Taylor sneakers, or get warm in a Ovo &Roots jacket in late autumn. BnB AiO supports 37 websites and developers are not going to stop and planning to expand this list. Just imagine no more tens of bots on your desktop. One magic pill to find whatever you wish. Besides various websites support, Better Nike Bot gives the choice of locals. No matter if you live in NY, jungles or at the end of the earth, the only things you need are a laptop and the internet. Choose an appropriate location and start cooking. The interface of the bot is multifunctional and involves in-built useful features for comfortable copping. There is a clone feature to make multiple accounts (useful for numerous purchases), credit card verification and a built-in keyword search. The more built-in features, the fewer tabs in the browser. As a result, the risk of a computer work slow-down and crash disappears. Nothing threatens your happy shopping time. Fast and secure. However, what does really deserve our praise is the cutting-edge keyword finder. It allows you to search a coveted item of clothing by name or style code making your search more exact and increasing your chances of a successful purchase. Quit worrying that you could miss your shirt, your sneakers, your jacket, your love. Buy Better Nike Bot. ‘Just do it’!